Há algum tempo que estava a ficar sem material para novas peças, mas esta sexta-feira tive mesmo de ir comprar umas coisas que me faltavam para acabar duas encomendas e decidi gastar algum dinheiro e atestar-me para a preparação para o Natal. Mas olhem para estas cores! Já me sinto inspirada..! I was running out of supplies for a while now, but this Friday I really had to go shopping to finish two custom orders. So I decided to spend a little more and buy some stuff for the Christmas preparation. I think I got a little mad and spend a little more than I should have.. But just look at those colors! I feel inspired already! Oh, lucky you! 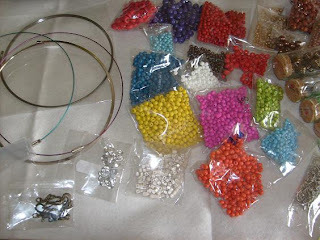 You went amok in the bead shop! What pretty colors to supply you with endless inspiration! Have fun! I always go crazy too, when I go supplies shopping! It's so easy to just buy everything! I can't wait to see your new creations, Ana!! !